How does an active or passive temperature compensation of pressure transmitters actually work? High-quality pressure transmitters, especially those used in precision critical applications, are almost always provided with an individual temperature compensation. But what is actually the difference between an active and a passive temperature compensation of these sensors? Passive temperature compensation: Sections of the characteristic accuracy curve of the pressure sensor are measured at different temperatures during the manufacturing process. Then, the previously determined temperature errors are compensated by passive elements (resistors) within the electronics of the sensor or by corrections of specifically designed resistance structures directly on the sensor element itself (e.g. by laser-trimming). The (passive) resistor elements used have an almost linear temperature behavior, it is, however, only possible to compensate 1st order errors. Temperature errors of higher order, i.e. strong bending of the characteristic curve under temperature, can not be compensated. Active temperature compensation: Here too, the characteristic curve of the pressure transmitters is measured at different temperatures during the manufacturing process. However, the pressure transmitter has an additional integrated temperature sensor which constantly measures the temperature of the sensor and transfers it to the pressure transmitter’s signal processing. In practice, two methods of active temperature compensation are common: the first method compensates by means of a limited number of samples, , i.e. discrete correction values, between which interpolation takes place. The second method uses the electronics of the transmitter and a higher-order equation resulting from the regression of the acquired measurement values in order to compensate then the expected error. During operation, this signal processing makes it possible to automatically, i.e. “actively”, compensate the pressure transmitter ‘s temperature error using the calculated correction factors within a specified temperature range (e.g. 10-60°C). 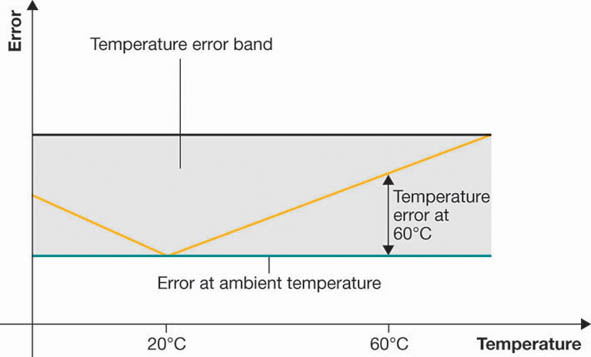 The most commonly used method to minimize temperature errors of pressure sensors is a passive temperature compensation. This is the traditional method which is widely used. However, active temperature compensation is the top class of possible compensation methods. WIKA has constantly improved and refined this technology in recent years. The pressure transmitters of WIKA using active temperature compensation therefore feature a temperature error which is almost zero in their specified temperature range.